The Cheesecake Factory is an upscale dining establishment perfect for families or those who love the generous entrees and huge menu selection. Consistently prepared, high-quality selections including pizza, pasta, steaks, seafood, salads and sandwiches. 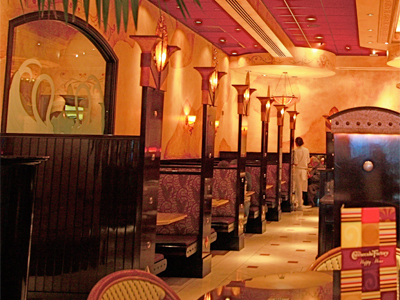 The Cheesecake Factory is an upscale dining establishment perfect for families or those who love the generous entrees and huge menu selection. Consistently prepared, high-quality selections including pizza, pasta, steaks, seafood, salads and sandwiches. Leave room for one of the over 50 varieties of cheesecake, such as white chocolate raspberry truffle! The waiter will bring out a bread basket to start and as delicious as it is, don’t eat too much because the entree portions are huge and meant to be shared or boxed up for a midnight snack at home. A great place to recoup your energy while in The Forum Shops! The food was really good, but service a bit slow. If you sit inside the restaurant you can’t see the aquarium. Good location to eat if you want to be touristy. I’ve eaten at many Cheesecake Factories. But I walked into this one 5 min before closing. Requested a booth in a corner that was unmanned by any servers. Our server came over and gave us some of the best service I’ve had at a Cheesecake Factory. Great food as always, but even greater service this time around. Sliders you will fall in love with. The caeser salad was a nice touch on the side. Servers were professional and made you feel pleased. Go and enjoy a nice lunch. Excellent service and food huge portions and the best cheesecake EVER!!!!!! !